Conor Oberst’s punk band Desaparecidos are finally just one week away from releasing Payola, the followup to their 2002 debut, and they’re now streaming the entire thing. If you’ve been following the band’s reunion, you may know that six of these songs were previously released as singles, and they fit perfectly in the context of the album with the remaining eight new ones. Joining previously-released politically-charged anthems like the hacktivism ode “Anonymous” and racism critique “MariKKKopa” are new ones like the So So Glos-assisted attack on slacktivism, “Slacktivist” (“just ‘like’ this and the problem is solved”), and the commentary on racial profiling during stops and searches, “Search the Searches” (“turns out my friend’s brown, they had to pat him down”). It’s the most passionate Conor has sounded on a record in years, and just a truly excellent album. Listen below, and pre-order it from Epitaph if you like what you hear. 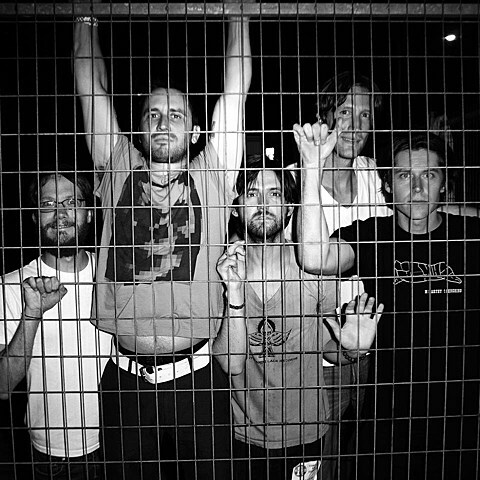 Desaparecidos also have tour dates coming up, including three in NYC: June 25 at Shea Stadium with The So So Glos (sold out), June 26 at Rough Trade NYC with Bandroidz (sold out), and Webster Hall on August 6 with both of those bands (tickets). They also play The Fest, Fun Fun Fun Fest, Riot Fest (Chicago and Denver), and other festivals.